Last week, while passing the White Swan, negotiating my way through the scaffolding poles and pedestrians on the pavement in Piccadilly, peering nosily in to have a look at how work was progressing, I noticed a small display of ‘relics’ in a slim display case on the wall of the building. I guessed that these were things the builders have found inside as the White Swan is gutted and remodelled. 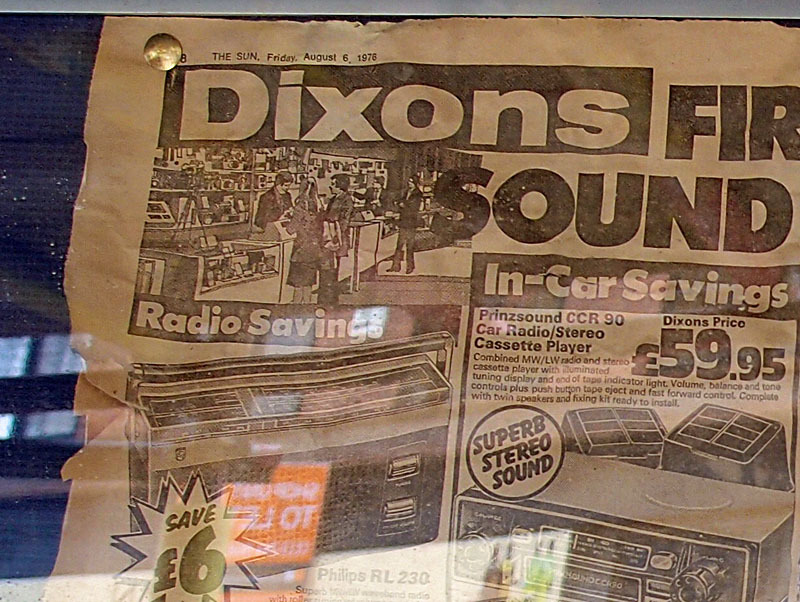 The reflections in the glass made it difficult to get clear images, but the display included a page from The Sun, from 1976, with a groovy old ad for Dixons. Reminders of mid-70s technology, like cassette players in cars. In those days you still had to endure the physical effort of getting up from the sofa to push buttons on the TV itself to change channels. That’s why we were all so fit back in the 70s. 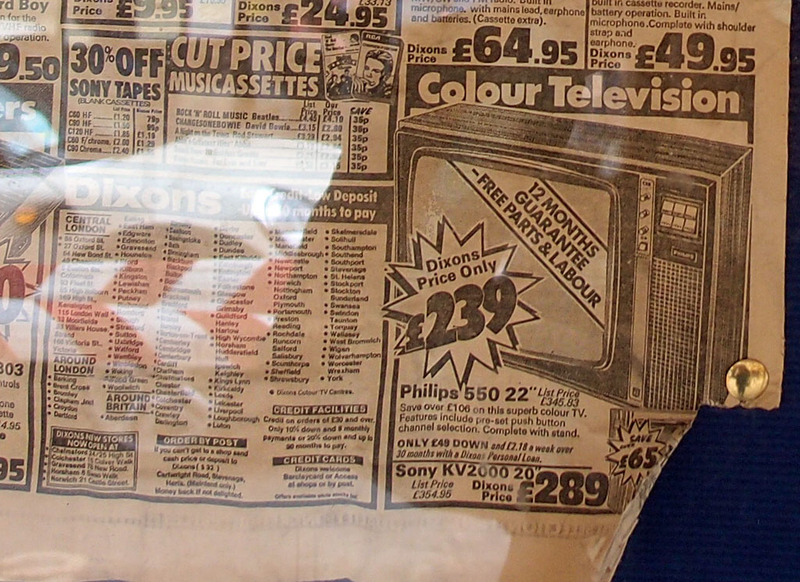 But this advertised TV offered the alluring prospect of ‘pre-set push button channel selection’. 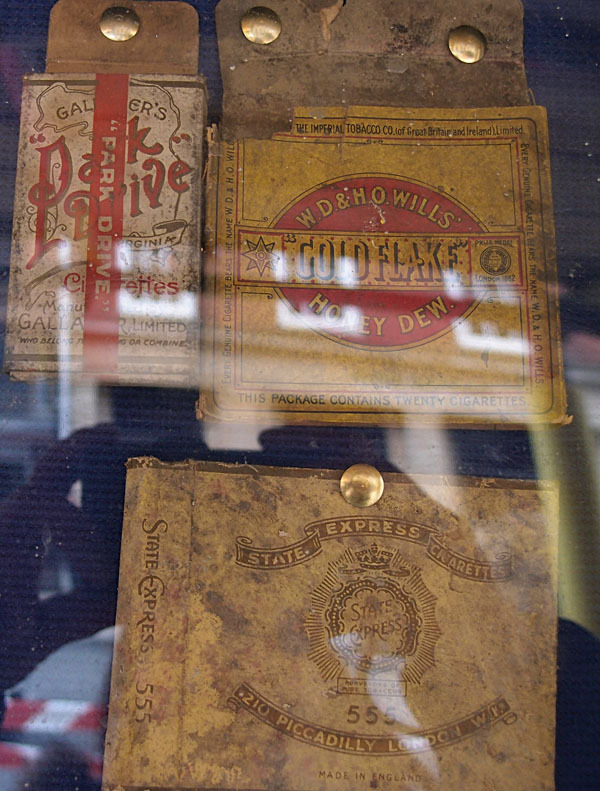 A little older I think, several cigarette packets: Park Drive, Gold Flake and State Express. There was no explanatory caption to this, I just guessed they’d been found inside. I’ve got a box full of ‘relics’ discovered during work on this house – sections of old wallpaper uncovered and kept, and bits of clay pipe and old floor tile dug up in the garden. Thought it was rather nice that someone had gone to the trouble of displaying these. 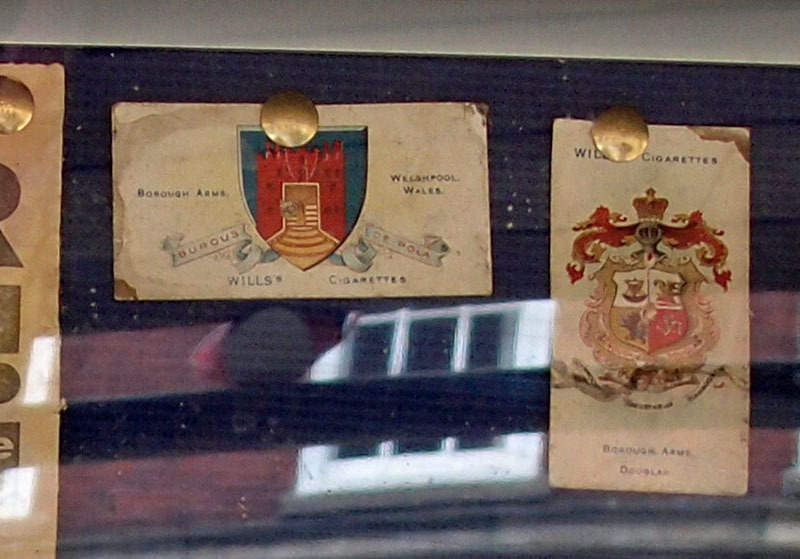 Cigarette cards, which were, apparently, used to stiffen cigarette packets and advertise cigarette brands. I asked one of the men in hard hats about the display. He said these items were found under the floor. This seemed reasonable at the time, a bit odd when I thought about it later, until I remembered how much rubbish I noticed under our floorboards when they were lifted for plumbing and central heating work. Anyway, nice to see these things on display. If they were under the floorboards then presumably they’re relics left by previous generations of builders and plumbers doing work on the building. If discovered above floorboard level then they’re reminders of this building’s days as a hotel and restaurant and bars. The man in the hard hat knew too about the White Swan’s brief opening up as the Rainbow Peace Hotel. Even though the ceilings are missing and it’s still a dark gloomy shell when you look inside from the Piccadilly doors, the graffiti is still there, bright paint on the pillars. All part of our recent history. Just as interesting, to many of us, as our famous ancient history.